Though director Guy Hamilton was the man responsible for Goldfinger, which, in the early years, set the stage as the quintessential Bond film for many, expertly blending an intricate plot, playful idiosyncrasy and inventive action, his three follow-up films, Diamonds are Forever, Live and Let Die, and this, The Man with the Golden Gun, proved increasingly campy and tonally erratic. With Live and Let Die's preoccupation with blaxploitation and Golden Gun's focus on the martial arts craze of the early '70s, it could even be argued that these entries marked a low point in the franchise, scraping ideas from the populist lexicon rather than sustaining key series elements. This unfortunate lack of confidence and preoccupation with catering to mass cultural fads was essentially the undoing of this ninth entry into the 007 canon. Its plot, which finds Bond (Roger Moore) battling with the similarly debonair and witty Scaramanga (Christopher Lee) to obtain a Solex Agitator—something described as harnessing the power of the sun, reiterating the dominant political energy crisis concerns of the time—had some inherent intrigue. Being pitted against a villain of equal aptitude and utilizing more traditional spy tactics to propel a narrative that finds conflict from within could have marked a series high, especially considering the high production values and capable cast members. But when the dippy and incompetent Mary Goodnight (Britt Eklund) pops up as Bond's assistant, messing up every task she's assigned, and some fat, stupid Americans wind up in the middle of two different chase sequences, being assaulted by a baby elephant and doling out terrible one-liners, it's difficult to take any of the action, or narrative, seriously. Worse still is that the machinations of a fairly straightforward and appealing story are frequently interrupted for ridiculous kung-fu shenanigans involving teen schoolgirls defeating an entire dojo and, more unfortunately, a battle between Bond and two sumo wrestlers. 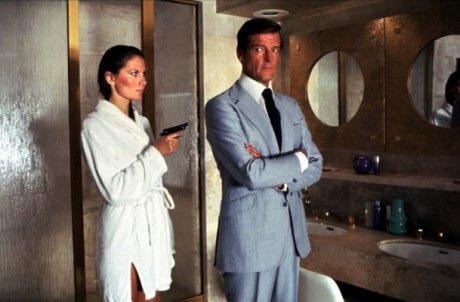 And while Bond's treatment of women has never been particularly progressive, his protracted roughing up of Scaramanga's mistress (Maud Adams) is exceedingly discomforting to watch, which is exacerbated by his constant flirtation and attempted sexual conquest of her, showing a series high level of misogyny. It's unfortunate that such backwards thinking and dreadful pandering derail this particular 007 mission on so many occasions, as the exotic locales, thoughtfully composed action and self-aware core conflict marked an upswing in thematic and visceral content for the series. As it stands, Golden Gun is one of the messier, more unintentionally amusing, Bond films, praised only for Christopher Lee's performance in a modern capacity.